In 2012, the U.S. Department of Transportation (USDOT) reported that 4,957 people were killed in motorcycle accidents. This was an increase of 7% from the 4,630 motorcyclists killed in the previous year. Additionally, there were 93,000 motorcyclists injured during 2012, which was a 15% increase from 81,000 in the previous year. Motorcycle riding has become so dangerous in fact that USDOT estimates that per mile motorcycle drivers and passengers are 26 times more likely to experience a deadly accident than those in passenger vehicles. With over 7 million registered motorcycles in the United States, these trends are likely to continue. When you’ve been injured in a motorcycle accident, it’s important to get started right away in protecting your legal rights. The Houston motorcycle accident attorneys at Richard J. Plezia & Associates can help. The most common form of motorcycle accidents happen when either a car or truck is making a left-hand turn and does not stop for the oncoming motorcycle, most likely the result of not looking for motorcycles on the road as the result of distracted driving. Motorcyclists will often strike the car as it makes the turn or crash when attempting to avoid the car. Motorcycle accidents are also more likely to occur at times with diminished visibility, such as at night or during a storm, even in motorcycles with particularly bright head and rear tail lights. Again, drivers are looking for a pair of lights rather than a single one and can mistake a motorcycle for a street sign or other object. Road hazards are also a common cause of motorcycle accidents. Given the smaller size and lowered stability of motorcycles, common items like potholes, manholes, dead animals, unsafe roads, construction, bumps in roads, and other road irregularities on public streets or parking lots can cause the motorcyclist to strike the object or be thrown from the bike. In Texas alone, 428 motorcyclists were killed on the road in 2012. 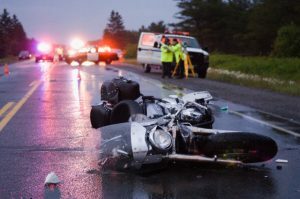 Victims of motorcycle accidents and their families often face dramatic life changes associated with the injuries sustained during the crash, many of which can be permanent. Challenges include getting urgent care, surgeries, follow-up care, physical therapy, and in some cases, extensive care that goes on for decades. Victims are also often left with large medical bills and a diminished capacity to earn the money to pay them. If you or a loved one has been in a motorcycle accident, there is a limited time to act. Please contact our Houston motorcycle accident attorneys today to discuss your case and your options to file suit with no obligation.